The Ethics of Metropolitan Growth: 14 Days and Counting . . .
14 Days and Counting . . . 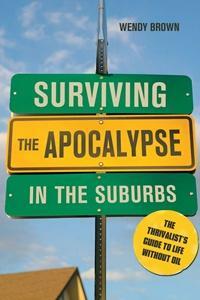 I have been continuing to read Wendy Brown's book, Surviving the Apocalypse in the Suburbs, though sporadically. My train commute really isn't all that long, and I've had many, many other things to read in the mean time. I have small addition to my review-in-progress of the book, which merges with the theme from my last post: skepticism. Imagine I came to believe the world as we know it really would end in 21 days and, following my own priorities, I decide to meet my neighbors and to work toward getting us all organized to prepare for the end. Why on Earth would they believe me? Because I am convinced, I might well regard their disbelief as irrational denial. But, in all fairness, consider the possibility that it is also, at least in part, rooted in a healthy skepticism. I am making an extraordinary claim - certain knowledge of the very hour at which the-world-as-we-know-it will end - which would require extraordinary proof. Yes, like the last man example, the 21 Days scenario is a thought experiment, a hypothetical "what if?" What if we learn the end is coming? As a thought experiment, the 21 Days scenario has its uses, as I've suggested, in spurring us to imagine the systems on which our lives are dependent. But Brown is going farther than that in this book and, it would seem, in her own life. She is using the immanence of the apocalypse as a regulative idea, acting and choosing as if she knew the end is at hand. She proposes we make serious, practical decisions on the basis of that idea, allocate resources one way or another, change the scope of our expectations. Some of these changes are probably reasonable even in the face of doubts about the apocalypse, perhaps even in the face of outright denial. Learning to can food is a good idea, for budgetary and cultural reasons, if for nothing else; it might be considered a hedge against risk. I've started eyeballing my own (very small and mostly shaded) back yard for its food-growing possibilities. There are likely to be herbs and various cane berries back there, before too long. But some proposals make sense only in light of certainty not only that the end is coming, but that it is coming soon. In fact, Brown has, in some domains, begun to act as though the apocalypse has already happened. To take one small example, consider what she has to say about tea. Brown seriously proposes giving up tea now, simply on the grounds that, when the end comes, she is likely not to be able to get tea any more, and she'll miss it. I get the sense, from context, that this is something she thinks she should do now, in the real world, not just in the thought-experiment world in which there are (by the time she gets to working on food) only 16 days to go. Really? Forego one of the finer fruits of civilization on the grounds she may not have access to it for all of the rest of her days, because of a hypothetical apocalypse that might be months or years or decades away, if it happens at all? But, if the end really were coming, and we really had a full 21 days to prepare, that would be plenty of time to step down caffeine consumption, if that were really a priority. In the mean time, I'll have mine with milk and sugar, thanks. I'll have to see, when I get to the chapter on cleanliness, whether she is currently foregoing hot showers because she may not be able to take them after the apocalypse. More serious, I think, are some of the broader ramifications of the choices she proposes, the bunkering-in, hunkering-down mentality of the individualist survivalist, which may lead to a misallocation of resources, in the long run, should the apocalypse be delayed, or if our decline from the oil age turns out to be more gradual than we imagine. Chief among these, I think, are the implied withdrawal from civic concerns. Brown's is a small-boat survivalism, perhaps a lifeboat survivalism - with all that implies. As an aside, I wonder whether she's simply assuming the civic institutions that give us the illusion of self-sufficiency, allowing us to be secure in our selves, our homes, and our possessions, will survive the apocalypse, too. I see no indication she plans to stockpile weapons to protect all her carefully managed private resources from the intrusion of lawless others. If she's built a lifeboat for herself and her immediate family, to borrow Garrett Hardin's metaphor, how will she prevent others from climbing aboard and either throwing her off or sinking the whole thing? I would favor a big-boat survivalism, the goal of which is to find ways to continue the broad human project of sustaining civilization, in whatever form it ends up taking through the perils to come. But the starting point, for me, is the acknowledgment that, although times are perilous, we do not have good reason to believe human civilization is a terminal case, at least not in the immediate future, any more than we have good reason to believe we will be able to keep living as we are now living indefinitely. Brown, Wendy. 2011. Surviving the Apocalypse in the Suburbs: The Thrivalist's Guide to Life Without Oil. Gabriola Island, BC: New Society Publishers. nice wonderful journey to came here. I found you by mistake and I read one topic on your site by mistake and I found unique information. I saved in bookmark. Robert Kirkman holds a Ph.D. in Philosophy from Stony Brook University. He is Associate Professor in the School of Public Policy at the Georgia Institute of Technology. (c) Robert Kirkman. Simple theme. Theme images by mammuth. Powered by Blogger.